Welcome to the Helsinki Sightseeing 3T Tram Audio Guide site. The 3T tram tour runs in a figure of eight around some of the top tourist sights of Helsinki. This enhanced audio guide supplies an audio and visual commentary for this journey. Catch the tram and play this recording on an iPod, MP3 player or portable audio player to experience a tour of the sights and sounds of this historic and vibrant city. 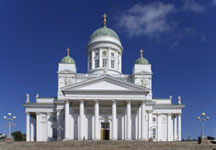 "The history of Helsinki, names of the Russian tsars, architectural gems like the rock church and the buildings by Engel are weaved into entertaining stories during the ride... This is a more individual way to get an introduction to the city at your own pace"
Now Free! Because of route changes to the 3T tram this guide is now free. Parts of the route will be different, but you should still be able to gain some enjoyment from listening to it whilst on the tram. An updated version of the guide may be produced in the future. Please support this project by making a PayPal donation using the button below. Thankyou. The 3T tram route starts and finishes on the corner of Kauppatori, the market square on the sea front, and lasts about one hour. 3T route change. The 3T route has recently changed. Over 80% of the guide is still correct. Before you take the tour we recommend you visit the Helsinki City Tourist & Convention Bureau in person to pick up a 3T sightseeing leaflet to accompany this tour or download and print it. The tram stops and highlights listed on the leaflet match the audio guide and the included map will help you find your way. Read these Tips and Advice to help you get the most from this Enhanced Audio Guide. Please email if you have any questions or feedback on this product.